Responsible Care has long been viewed as industry's commitment to world-class environmental, health, safety and security performance. As Responsible Care enters its fourth decade, ACC and its members are leveraging the foundation laid by Responsible Care to grow and enhance our industry's contributions to sustainability. Join us for the 2019 Responsible Care & Sustainability Conference & Expo to explore how Responsible Care and ACC's Sustainability initiatives are helping stakeholders integrate the three components of sustainability - economic, environmental, and social - into their core business practices. Learn more about ACC's commitments to sustainability by visiting www.sciencebehindsustainability.com. Register by March 21, 2019 and save $200 by taking advantage of our early-bird discounts! The chemical industry plays an essential role in cultivating circularity and sustainability. While progress will take time, stepwise advances include prioritizing resource conservation and efficiency and driving innovations in products and processes. This session will provide an overview of industry’s engagement on this important issue and how leading organizations are implementing sustainability programs that enhance circularity. ACC recently published an updated version of the Responsible Care Management System® (RCMS) Technical Specification, featuring enhancements to organizational planning and training requirements, among others, and ACC implemented changes to the certification process and Responsible Care logo usage guidelines. This session will provide an overview of these changes and help participants understand how these changes may affect how their companies implement Responsible Care. 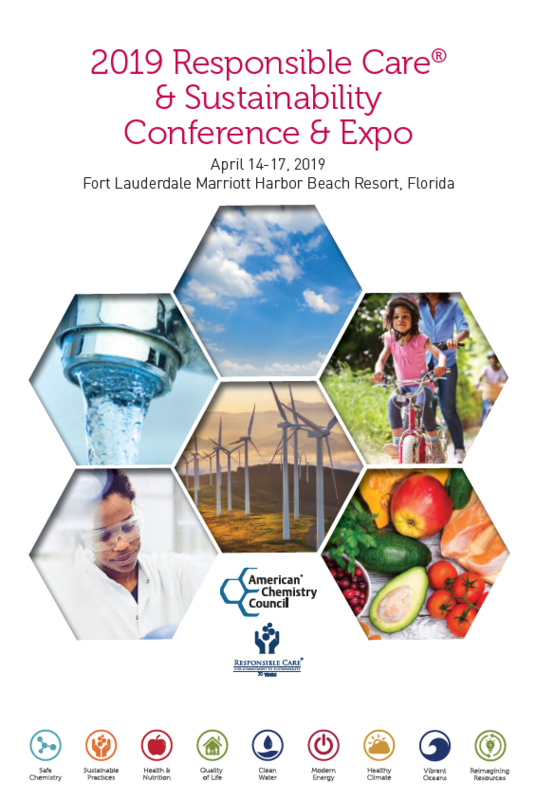 Download the 2019 Responsible Care & Sustainability Conference & Expo Brochure!